Missionaries Tim and Beth Heiney are back home in Guinea West Africa. Member Alice Tritsch invites us to participate in a project for Beth in medical ministry that was established by a fellow missionary! Homemade diapers for babies and adults; lightweight layettes for newborn babies; homemade sanitary napkins and underwear for women are needed for the people of Guinea. On February 16th at 1 p.m. everyone is invited to cut out and assemble some of the above items. There will be a box in the church annex to collect donated items for these projects. Lightweight infant size blankets, skull caps for newborns and booties (may be hand knitted), white cotton material to make changing pads, new white cotton underwear for women (size small or medium), white Velcro strips (non-sticky), white t-shirts (may have a logo printed as we can use the back side of fabric for the diapers). Note: ALL items need to be bleach-able except for the skull caps and booties for the babies. We also need cash donations for postage as it is expensive to send these necessary items. Thank you for prayerfully considering this medical mission. Please contact Alice at 620-727-2482 or waaltr@gmail.com if you have questions or can help. Dillon’s Community Rewards have been a great blessing to our church over the last several years. So, first off, thank each of you that have let your shopper’s Plus Card be designated to the ministries here at Our Redeemer. Last year we received over $1000 from your grocery and fuel purchases. THANK YOU ! ! ! If you have not designated your shopper card, I encourage you to do so. 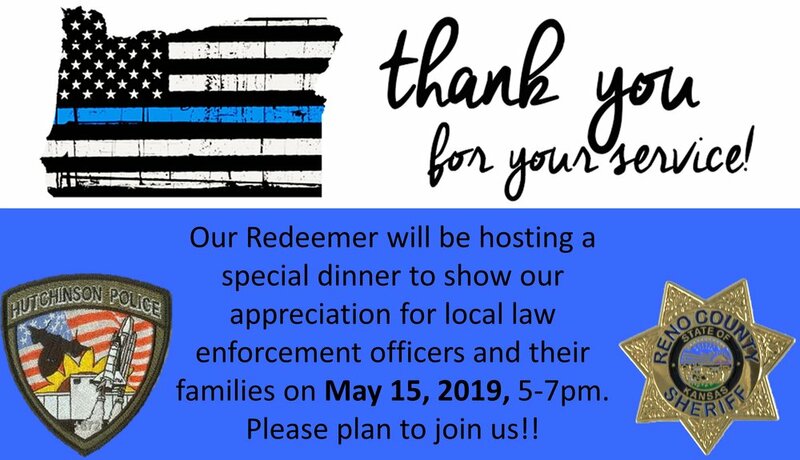 If you are not sure, look at the bottom of your receipt and it should say “At your request Dillons is donating to Our Redeemer Lutheran Church”. Now that the ELC is open, we have another great ministry for your reward dollars to help but, we have not received our “SELECT NUMBER” for “OUR REDEEMER LUTHERAN CHURCH EARLY LEARNING CENTER”, but we will print and communicate the number as soon as we do. We hope to have a kiosk in the atrium in January to help you enroll your card or you can enroll it at home. Below are some helps to enroll your plus cards. While shopping on Amazon don't forget to use this link smile.amazon.com/ch/48-0680455 and Amazon will donate to Our Redeemer Lutheran Church. We're on a mission! Each day we're on a mission to share the love of Jesus with our children and families, but this month we're on a specific quest to help us fulfill our mission: We Need To Find Quality, Christian Teachers! If you know of anyone who loves children and might be interested in a FULL or PART-TIME position here, please pass the word along! We are looking for both lead teachers and loving people who could work a few hours here or there. Please contact the ELC if you are interested in a position!